The show Tora with Anna Bousdoukou on SKAI TV presented the new grant of $27,477,000 to support a major initiative for the revitalization of the Greek agricultural sector, as part of its Recharging Τhe Youth Initiative, which aims at opening up new employment opportunities for Greece’s younger generation. The three-year project, entitled “Recharging the Youth: New Agriculture for a New Generation”, aims at training and developing a new generation of farmers, inspiring agriculture and food entrepreneurs, as well as fostering new business development. 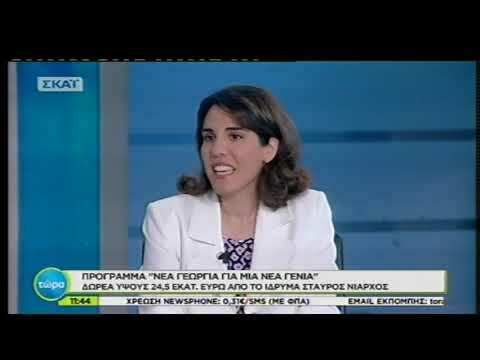 During the announcement, Eva Polyzogopoulou, Assistant Director of Programs & Operations in SNF, underlined the importance of the agriculture sector in young greeks’ employability and described the projects’ implementation procedure, spearheaded by Rutgers University–New Brunswick in partnership with the Agricultural University of Athens (AUA) and American Farm School (AFS) in Thessaloniki. Effie Lazaridou, Managing Director of the program, presented the three action pillars of the initiative and talked about the opportunities it will help create along the value chain of the sector.